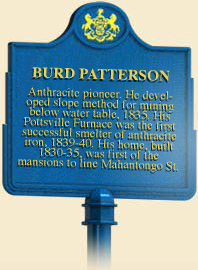 Burd Patterson was foremost a pioneer in the anthracite coal and anthracite-iron industry. In 1833 he sank the first slope mine below the underground water level, proving that slope mining was feasible in anthracite beds extending below the water level. In addition, he was among several people, including David Thomas, who helped develop anthracite-iron furnaces in Pennsylvania. Patterson also contributed to the development of bituminous coke furnaces. And he represented a new breed of ironmasters; hard-headed businessmen in search of profits who succeeded earlier, paternalistic owners of charcoal- iron plantations. Pay day at the Eagle Colliery, Girardville, PA, 1894. Born in 1788 of British and Pennsylvania ancestors, Patterson in 1824 visited Pottsville, which consisted of only twelve houses located on islands in a swamp. Realizing that entrepreneurs were beginning to exploit the southern field of the anthracite coal beds, he moved to the nascent town in 1825. Soon after be began investing in real estate and coal lands, becoming one of the major owners of coal properties in Schuylkill County. There he joined a group of elite Schuylkill County capitalists who often combined with Philadelphia investors to buy coal lands and lease them to coal-mining companies. He also worked with them to bring transportation lines, especially railroads, into the southern field so that extracted coal could be shipped to wider markets. Patterson also branched into the iron industry, joining the investors who formed the Clearfield Coal and Iron Company, which made pig iron with coke at Karthaus Furnace in 1838-1839. This early coke furnace failed because of poor transportation and poor-quality coke. His investments in anthracite iron furnaces were a logical extension of his land holdings, since these iron furnaces provided a ready market for anthracite. He was also instrumental in establishing the Pioneer Furnace in Schuylkill County, which went into blast successfully in 1839, the Rough and Ready Iron Works in Danville, the Shamokin Furnace, and furnaces in Frackville and St. Clair. In addition to investing in the industry, Patterson represented a break from earlier ironmasters of charcoal-iron plantations who had paternalistic relationships with workers. Earlier ironmasters, such as Roland Curtin and his sons at Eagle Ironworks, saw themselves as surrogate parents of employees and their families. They lived among workers and mingled with them frequently, looking after their welfare as well as depending on them to make the furnace a profitable business. In contrast, Patterson lived in his Pottsville mansion and had little or no interaction with ironworkers. He saw his many investments, including his ironworks, primarily as profit centers that made money for him and his fellow capitalists. Although he contributed to Schuylkill County communities, indeed helped to develop various coal towns, he did not watch over employees' welfare as earlier paternalistic owners did. Patterson was typical of post-1840 ironmasters in two other important ways. Like many others, he entered the industry with no prior experience in making iron. Only nine of the 113 ironmasters in Pittsburgh and Allegheny City in 1856 came from earlier ironworks; 60 percent came from mercantile backgrounds. Like Patterson, many ironmasters after 1840 came from American stock. For example, 88 percent of Pittsburgh's ironmasters were native-born. Patterson profited handsomely from his many investments in the anthracite coal and anthracite iron industries. When he passed away in 1867, he received praise for leading the industrial development of Schuylkill County. He also amassed a personal fortune and died a millionaire. Samuel T. Wiley, Biographical and Portrait Cyclopedia of Schuylkill County (Philadelphia: Rush, West and Company), 1893. Jr. Yearly, Enterprise and Anthracite: Economics and Democracy in Schuylkill County, 1820-1875 (Baltimore, MD: Johns Hopkins University Press), 1961.